Known for it’s Fado music, custard tarts, and pastel coloured streets, Portugal’s capital city, and OPI’s latest muse, is a true hidden gem. For being Western Europe’s oldest city, Lisbon has a flourishing cultural and creative scene; and in the past few years, it become a destination for travellers, photographers and Europeans looking to make the city their new home. Lisbon was built on seven hills, whose cobblestone streets are lined with artisan shops, local bodegas and world-renowned restaurants. Below we’re sharing some of our favourite spots to eat, sight see, shop, and immerse you in Portuguese culture. And yes, we actually went to all of these places on our trip there. 1. Pasteis de Belém – Lisbon is well known for their custard tarts, known by locals as Pastel de Nata. Head to one of Lisbon’s most well-known shops to pick of a box of freshly made tarts. Enjoy them with espresso, as a snack, or after dinner. 2. Pistola y Corazon – You wouldn’t think to eat Mexican food while in Portugal, but this restaurant is the exception. Run by a former Texan turned Lisboan, these tacos might be in the running for some of the best (and spiciest!) in the world. 3. Cantinho do Avillez – If you like a dimly lit, more romantic setting, this is the spot for you. Run by a Michelin Star Chef and local Lisbon celeb, Jose Avillez, the menu boasts sophisticated cuisine inspired by his travels and culture. 4. Time Out Mercado da Ribeira – Having opened in 2014, this old warehouse turned fresh food market has quickly become one of Lisbon’s most popular tourist destinations. Lined with over 35 kiosks, serving everything from local Portuguese food to pizza to sushi, there is something delicious for everyone. The best part? It’s open 12 hours a day so you’ll never go hungry. 1. Pena Palace – Located about 40 minutes outside of Lisbon’s city center in São Pedro de Penaferrim, this Romanticist castle is a truly magical site to be seen. 2. Miradouro das Portas do Sol – A gorgeous lookout points with views of the Alfama district (another must-do). Head here at sunset for an Instagram-worthy pic and serene end to the day. 4. Alfama District – Want to know where to go to see all the colourful homes and streets Lisbon is known for? Just walk up and down the steep streets of the Alfama neighborhood. Out of the way of the tourists, you’ll see laundry hanging above balconies, and men sitting at the local bodegas having their afternoon espresso. La Vida Portuguesa – FACT: souvenir shops do not have to be cheesy, and that is proven by local gem La Vida Portuguesa, which hosts artisanal products and hand-crafted goods that are vibrant with tradition. Whether you’re looking for colourful sardine cans, hand-painted tiles, or the local port, this store has the best of the best. LX Factory – The LX Factory is the most perfect representation of a new generation of creativity in Lisbon. Filled with trendy coffee shops and stores selling niche art, you might mistake this outdoor retail center with Brooklyn or the Arts District, except way cooler because it’s European. Bairro Alto – If you’re one for nightlife or even a casual drink with friends, this is the place for you. Steep, cobblestoned streets lined with bars that serve €1 beers. O Faia – Situated in the Bairro Alto Distric, O Faia is one of the most beloved venues for Fado Music while enjoying meals of traditional Portuguese fare. Between courses, the lights will dim, leaving nothing but the candlelight and the sound of intensely romantic vocals accompanied by a string guitarist. 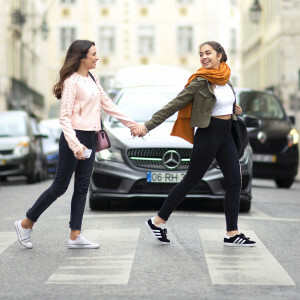 Head to OPI’s YouTube Channel to see more of our adventures in Lisboa.